BEST Moroccan Chicken recipe you will find! 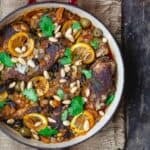 Super succulent, fall-off-the-bone tender chicken stew w/ warm Moroccan spices, lemons, olives & dried fruit. Be sure to check out the step-by-step tutorial up in the post. In a small bowl, combine Ras El Hanout and the remaining spices to make the rub. In a 12″ deep ceramic pan or braiser like this one, heat 2 tbsp extra virgin olive oil over medium-high heat until shimmering but not smoking. Add chicken (skin side down, if you kept skin) and brown for 5 minutes. Turn over and brown on the other side for another 3 minutes or so. Lower heat to medium-low and add onions, garlic, and cilantro. Cover and cook for 3 minutes, then add lemon slices, olives, raisins, and dried apricots. In a small bowl, mix the tomato paste and chicken broth. Pour mixture on top of the chicken as it cooks. Bring to a simmer for 5 minutes, then, keeping heat on medium-low, cover and cook for 30-45 minutes until chicken is tender and cooked through registering an internal temperature of 165 degrees F or higher. Garnish with more fresh cilantro and toasted almonds, if you like. Serve over plain couscous. Cook’s Tip: Allow at least 45 mins of inactive time for the chicken to marinate in the spice rub. Cook’s Tip: If you do have the time, spice the chicken ahead of time. Cover and refrigerate for 2 hours or overnight for more pronounced flavor. And if possible, bring chicken close to room temperature before cooking. Cook’s Tip: You can use boneless, skinless chicken pieces. Remember to adjust your cooking time down as it will be quicker to cook. Depending on how many pieces of chicken, you may not use the entire spice rub amount. Leftover Storage Tip: This Moroccan chicken is even better the next day. Refrigerate leftovers in tight-lid glass containers; it should keep well for 3 days or so. Simply heat stove-top over medium heat. Make sure to add a little more liquid as needed (broth or water). Recommended for this Recipe: all-natural Ras El Hanout North African (Moroccan) spice blend; sweet paprika. And from our Greek olive oil collection, Private Reserve. SAVE! Create your own 6-pack from our all-natural or organic spice collections. Try our Greek EVOO Bundle. Nutrition information assumes no skin. Nutrition information also assumes 4 servings, although this can easily serve 6.